This garage you can dress up or down and the quality is superior to all others in the marketplace. 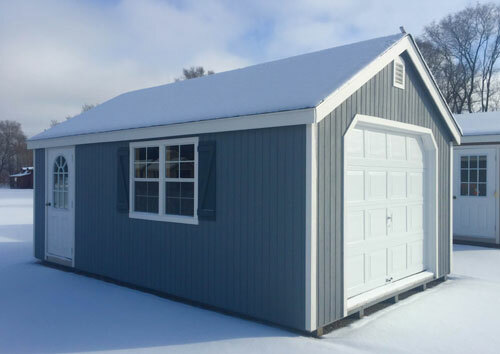 All of our garages have pressure treated plywood floors, 16″oc construction, 12″ oc pressure treated floor joists, architectural shingles, painted in your color of choice, 2′ x 6′ roof rafters in 12′ wide garages, extra wide trim for style and the list goes on and on. Available 10′ and 12′ wide. The length of the garage is 16′, 18′, 20′, and 24′. Shown is a 12×20.